Andy Cadman King's Manassa Turquoise Thunderbird Bracelet size 6 3/8"
This is one of Andy's "thunderbird" bracelets suggesting the silverwork of the twenties and thirties when thunderbird appliquées were common features of the era's tourist jewelry. 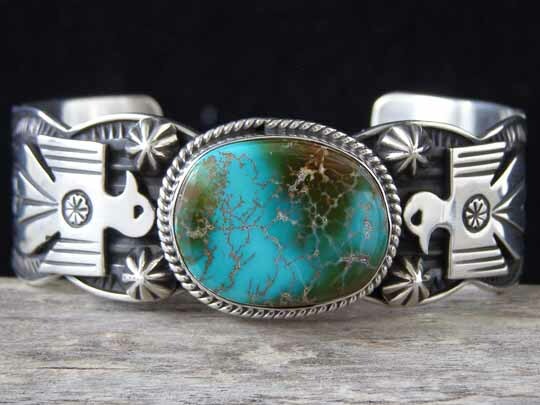 This bracelet holds a two-tone blue and green stone of natural, untreated King's Manassa turquoise set in a smooth bezel wrapped with twist wire. The edges of the cuff are scalloped in front and parallel at the terminals. Starred buttons mark the intermediate directions around this gorgeous stone. Hallmarked A. CADMAN and stamped Sterling inside the cuff behind the stone. Terminal to terminal: 5 3/8" Gap: 1"